The trustees of the charity do not claim expenses and all the money we raise is used to provide opportunities for needy communities in Nepal. We do not employ any staff. Our Major Project following the devastating earthquake in 2015 was to rebuild Dhandakharka School. 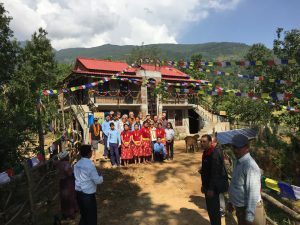 This project was completed in October 2016 and we travelled to Nepal in November to open the school . In January 2017 the foundations were laid for a hostel for girl students aged between 14 and 17 year’s old, that otherwise would live too far away from the Agriculture College in Phulkharka to attend . In November 2017 we travelled the Nepal to open the hostel. The girls aged between 14 and 19 come from families that are too poor to afford the $10/month college fees. They will live in the hostel and work on the smallholding in their free time and in return will be provided with board and lodging and receive their tuition fees and some pocket money. this will also help to fulfil the practical requirement of the course. This is time of huge change in Nepal where the land traditionally used for subsistence rice farming is being abandoned due to out migration. The college will teach them new agricultural techniques (sustainable livestock farming and growing cash crops such as coffee and cardamom). This will allow those who wish to stay in the area, a way of sustainably using the land and for those who wish to move on, the opportunity to study agriculture at university. The biogas system should reduce the demand for firewood for cooking with all its implications for reducing soil erosion and for flood management in the catchment area. It will also be used as an example of best practice for the surrounding villages. The project which the Rotary Clubs of Skipton and Settle have helped to raise money for includes a solar power and biogas system (to be run from animal and human waste). We have also received a Rotary District grant.